You can save lives with your giving. Here’s how. Giving to charity is great — including on Giving Tuesday, November 27! — not just for the recipients but for the givers, too. But it can be intimidating to know how to pick the best charity, especially when there are thousands of worthy causes to choose from. Here are a few simple tips that can help. Malaria Consortium, which helps distribute preventative antimalarial medication to children (a program known as “seasonal malaria chemoprevention�?). Schistosomiasis Control Initiative (SCI), Evidence Action’s Deworm the World Initiative, END Fund, and Sightsavers, which all work on deworming programs to prevent parasitic infections. Helen Keller International, which provides technical assistance to, advocates for, and funds vitamin A supplementation programs in sub-Saharan Africa, which reduce child mortality. Against Malaria Foundation, which buys and distributes insecticidal bed nets, primarily in sub-Saharan Africa but also in Papua New Guinea. GiveDirectly, which directly distributes donations to poor people in Kenya and Uganda, to spend as they see fit. GiveWell chose those charities based on how much good additional donations would do, not necessarily how good the groups are overall; in other words, these are organizations that can put new funding to use, rather than sitting on it. Do you ever struggle to figure out where to donate that will make the biggest impact? Over five days, in five emails, we’ll walk you through research and frameworks that will help you decide how much and where to give and other ways to do good. Sign up for Future Perfect’s new pop-up newsletter. The group also takes disconfirming research seriously. In 2017, it recommended Evidence Action’s No Lean Season, which offers no-interest loans to farmers in Bangladesh during the “lean season�? between planting rice and harvesting it; the loans are conditional on a family member temporarily moving to a city or other area for short-term work. But a subsequent randomized evaluation found that the program didn’t actually spur people to migrate or increase their incomes, and GiveWell and Evidence Action then agreed that it should no longer be a top charity; Evidence Action stopped soliciting funds for it. GiveWell recommends that, if you want to maximize your giving, you give through GiveWell to dispense the money at its discretion; GiveWell gets regular information on which highly effective charities need more money and which ones don't, and can direct donations more efficiently than an individual donor. But if you’re not comfortable giving through GiveWell, giving directly to any of the eight is fantastic. GiveWell's recommendations rely heavily on both evaluations done by charitable organizations and existing research literature on the kind of intervention the charities are trying to conduct. For example, its recommendations of SCI, Sightsavers, the END Fund, and Deworm the World are based on research suggesting that providing children with deworming treatments could improve educational, economic, and other outcomes. Research from the Poverty Action Lab at MIT suggests that giving away insecticidal bed nets for free — as the Against Malaria Foundation does — is vastly more effective than charging even small amounts for them. And while cash certainly has its limits, hundreds of studies have found largely positive effects for the kind cash transfers that GiveDirectly distributes. 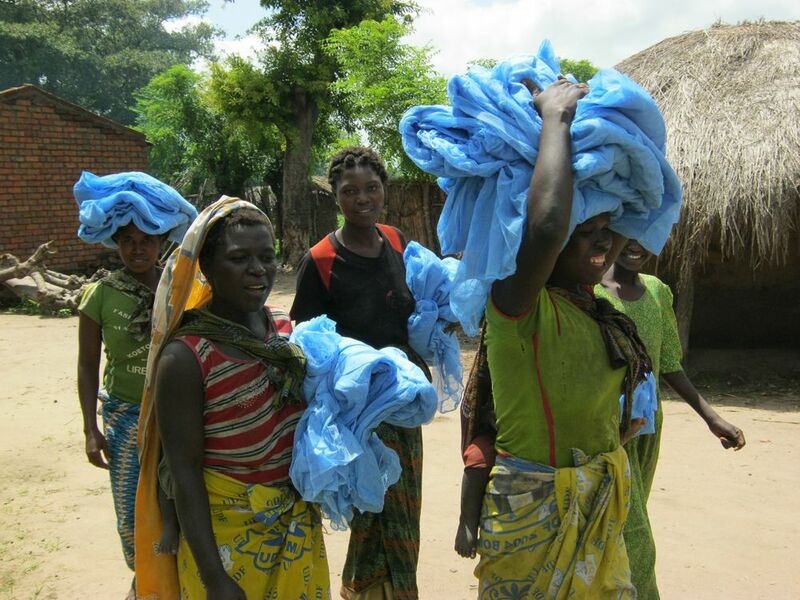 Women in Dedza, Malawi carry antimalarial bed nets. It's really hard to adequately express how much richer developed nations like the US are than developing ones like Kenya, Uganda, and other countries targeted by GiveWell's most effective charities. We still have extreme poverty, in the living-on-$2-a-day sense, but it's comparatively pretty rare and hard to target effectively. The poorest Americans also have access to health care and education systems that are far superior to those of developing countries. Giving to charities domestically is admirable, of course, but if you want to get the most bang for your buck in terms of saving lives, reducing illness, or improving overall well-being, you're going to want to give abroad. GiveWell actually looked into a number of US charities, like the Nurse-Family Partnership program for infants, the KIPP chain of charter schools, and the HOPE job-training program. It found that all were highly effective but were far more cost-intensive than the best foreign charities. KIPP and the Nurse-Family Partnership cost more than $10,000 per child served, while deworming programs like SCI's and Deworm the World's generally cost between $0.25 and $1 per child treated. Animal Equality, which conducts undercover investigations against factory farms, corporate campaigns to change food industry practices, and lobbying efforts to pass animal protection laws. The Humane League, which specializes in corporate campaigns to improve farm standards, and has achieved big victories in eliminating the culling of baby chicks and getting food service companies like Kroger and Sodexo to only use cage-free eggs, and is now pushing for better standards for chickens raised for their meat. The Good Food Institute, which promotes plant-based and cultured meat alternatives to animal-based foods. The Albert Schweitzer Foundation, conducts corporate campaigns in Germany and Poland and is unusual in advocating for farmed fish as well as chickens and mammals. Another option is giving to groups like GiveWell, Innovations for Poverty Action, the Life You Can Save, Giving What We Can, and 80,000 Hours that evaluate development approaches/charities and encourage effective giving. Suppose that every dollar given to Giving What We Can — which encourages people to pledge to donate at least 10 percent of their income until retirement — results in $1.20 in donations to the Against Malaria Foundation. If that's the case, then you should give to Giving What We Can until the marginal effect on donations to Against Malaria hits $1 or lower. "If they can turn a dollar of donations into substantially more than a dollar of increased donations to effective charities, isn't that the best use of my money?" asks Jeff Kaufman, a software developer who with his wife, the fantastic effective altruism activist and organizer Julia Wise, gives about half his income to effective charities and meta-charities. 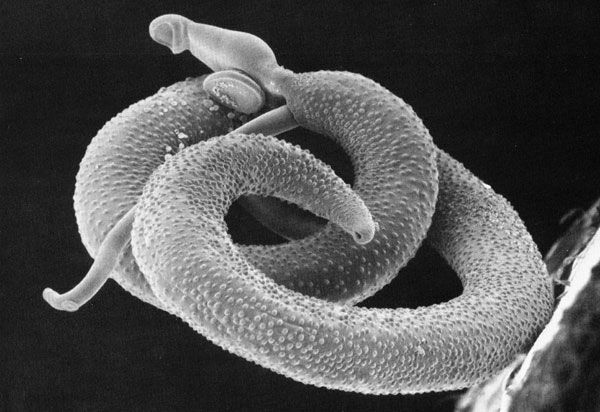 Two Schistosoma mansoni, one of the parasites that causes schistosomiasis (which SCI combats). Schistosomiasis is not usually lethal, but it can permanently harm children’s development and growth. If you only care about reducing early mortality and giving people more years to live, then you should give all your donations to the Against Malaria Foundation, the Malaria Consortium, or Helen Keller International. Malaria is a frequently fatal disease, and cost-effective interventions to reduce malaria infection are a great way to save lives. Similarly, Vitamin A supplementation, like HKI does, is an effective way of reducing child mortality. But the rest of the charities GiveWell recommends don't mainly focus on reducing mortality. Quality of life matters, too. Parasitic infections hamper children's development and education, which can have negative consequences lasting decades. Having increased access to cash may not extend the life of a GiveDirectly recipient, but it does make life considerably more pleasant. You'll notice that all of the charities GiveWell recommends are reasonably small, and some big names are absent. That's not an accident. In general, charity effectiveness evaluators are skeptical of large relief organizations, for a number of reasons. Large organizations tend to be less transparent about where their money goes and also likelier to direct money to disaster relief efforts, which are usually less cost-effective, in general, than public health programs. "Overall, our impression is that your donation to these organizations is very hard to trace, but will likely supplement an agenda of extremely diverse programming, driven largely by governments and other very large funders," writes GiveWell cofounder Holden Karnofsky. 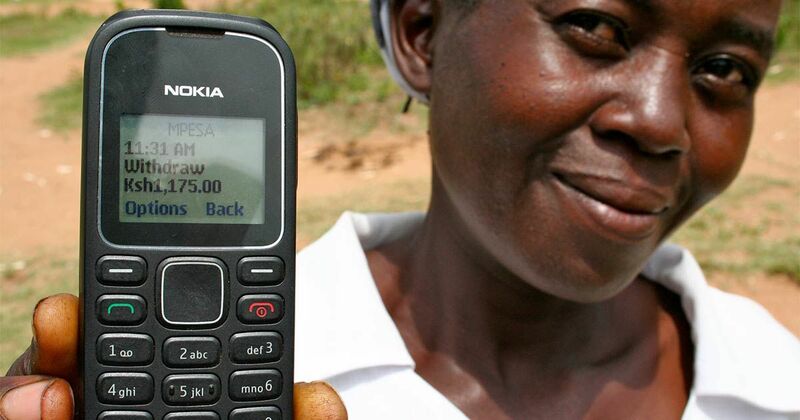 GiveDirectly uses the M-PESA system for mobile cash transfers. One of the main charities I support is GiveDirectly, which is the only cause outside public health to get GiveWell's top rating, and, to my knowledge, the only charity devoted to unconditional cash transfers. I give to them partly because there's a large body of research on the benefits of cash transfers, which I find quite compelling. But I donate to GiveDirectly mostly because I don't trust myself to know what the world's poorest people need most. I've been profoundly lucky to never experience the kind of extreme poverty that billions of people worldwide have to endure. I have no idea what I would spend a cash transfer from GiveDirectly on if I were living on less than $2 a day in Uganda. Would I buy a bed net? Maybe! Or maybe I'd buy an iron roof. Or school tuition for loved ones. Or cattle. But you know who does have a good sense of the needs of poor people in Uganda? Poor people in Uganda. They have a very good idea of what they need. Do they sometimes misjudge their spending priorities? Certainly; so do we all. And bed nets and deworming treatments appear to be underpurchased relative to the actual need for them. But generally, you should only give something other than cash if you are confident you know the recipients' needs better than they do. With the exception of bed nets — which really do seem underprovided when they're just put up for sale rather than given away for free — I'm not confident of that. So I give cash. As the World Bank's Jishnu Das once put it, "'Does giving cash work well' is a well-defined question only if you are willing to say that 'well' is something that WE, the donors, want to define for families whom we have never met and whose living circumstances we have probably never spent a day, let alone a lifetime, in." If you're not willing to say that, then you should strongly consider giving cash. One of the hardest problems in philanthropy is deciding how much to donate. There are some people who argue the correct answer, unless you’re near the end of your life, is nothing: you should, on this view, not give to charity during your career, and instead save as much of your money as possible and donate it when you die (my colleague Kelsey Piper explains why this is probably not a good approach). Another approach is to “earn to give�? : take a high-paying job, typically in finance or tech, and give a huge share, like 40 to 50 percent, of your earnings away. I wrote about people who do this back in 2013, and I know that many of the people I profiled still earn-to-give; for them, at least, this is a sustainable option. It’s a really good career option if you like working in finance and tech, but frankly it’s not the best option for most people, and there are a lot of amazing jobs — in scientific research, in the private sector, in direct charity or nonprofit or government work — where the typical person can do more good than they could by using their career as a mechanism through which to generate donation money. So I suggest a more moderate course. I’ve signed the Giving What We Can pledge, which commits members to donating 10 percent of their annual income to highly effective charities. That is a totally reasonable number, comparable to alms in many religions, that requires relatively minimal sacrifice relative to what earn-to-give people do. Even if 10 percent is too much for you, though, don’t despair. Giving $1 is better than giving $0. Perhaps the most important thing is to just get into the groove of donating, to make it a habit. I use direct deposit on my paychecks to make most of my charitable contributions, just so it’s extremely automatic and hard for me to avoid doing. Going from not giving to giving a little, regularly, is a huge positive step.